Summary: It’s the year 2044, and the real world is an ugly place. Review: Such an interesting dystopian novel. It’s so descriptive with all the 80s and video game references. The way things were described definitely had me thinking I was in the OASIS world. I have to admit that the first 100 pages or so was very hard to get through. It was a lot of world building and information thrown out there. But once you get past those 100 pages you just can’t put the book down. You get immersed into this world and you can see it happening in front of you. Most books I read it’s hard to picture what I think things look like (if that makes sense). Like, if this novel was to turn into a movie how would I think everything would be portrayed and how the characters would look. But I felt this was so descriptive it happened seamlessly. Being born in the 90s I didn’t get a lot of the references, but I did get some! Not knowing the references either did’t make the book any less fun either. Interested in reading other books by Ernest Cline. I would definitely recommend this book for people who love the 80s and video game culture! Or people who need a different spin on dystopian novels. 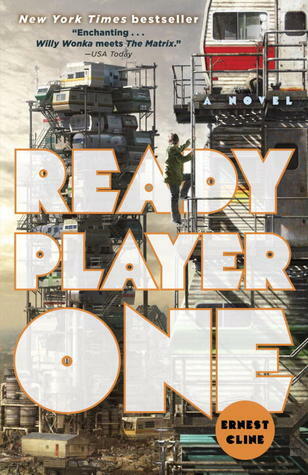 This entry was posted in book, book review, books, ready player one, review. Bookmark the permalink.